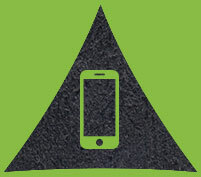 Mats made to be better. Way better. 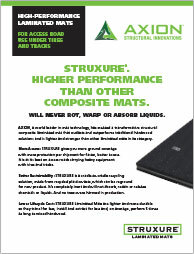 As the others degrade, Axion’s STRUXURE® Construction Mats stay on the job for years and years. 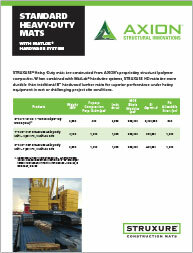 Engineered for consistent, predictable performance, they reliably go far beyond the lifespan of traditional mats. 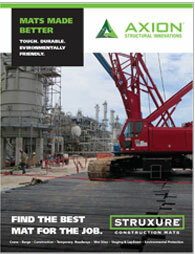 Using our proprietary structural composite formula, STRUXURE mats are extremely strong, durable and impervious to rot, fungus, insects and moisture. 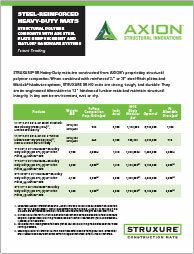 And since they’re especially ideal in wet or harsh-temperature environments where their performance properties remain unchanged, they make an excellent and cost-effective, long-term solution.